Frank Bower worked in education for nearly four decades. His career spanned a remarkable era in America history. 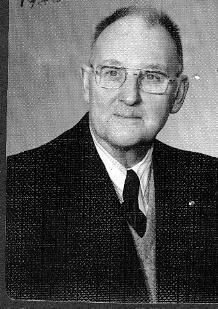 He began teaching during the Great Depression of the thirties and by the time World War II began he was the principal of Yelm High School. Bower left Yelm as the Korean War was ending in a ceasefire. His tenure at North Thurston High School witnessed the assassination of John Kennedy and Martin Luther King, Jr. The military escalation in Vietnam and Nixon’s presidency were also backdrops to his North Thurston career. In an essay entitled “My Life,” written at college, Frank Bower recalled he was born in “a square, ugly old house.” He added, “to me it was beautiful.” The house was in Montesano, Washington, his home for the next two years. His father, took a job running a steam donkey in a logging camp near Westport and family moved to the coast near Andrew’s Creek. Subsequent moves took the family back to Montesano, then Olympia during the war years, then south to the logging community of Bordeaux. Young Bower loved to spend his free time visiting the mills and learning about the machinery. By age fourteen was spending his summers working at the mill, beginning to save the money which would eventually take him to college. The Bordeaux families sent their children to Rochester High School. 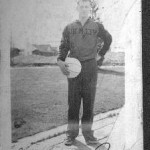 It was there that “bashful” Frank Bower lettered in baseball and basketball for all four years. Bower was particularly proud of Rochester’s basketball team from is senior year. That team won the league championship during nail-biter of a game which required three overtimes for the final Rochester triumph. Upon graduation Bower headed to the College of Puget Sound. 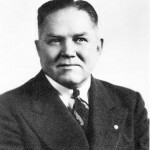 In the midst of the Great Depression, Bower earned a teaching degree, married, and began his teaching career in Rainier, Washington. 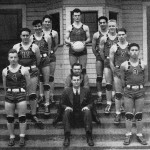 Two years later, in 1938, Frank Bower, 28, took a teaching position at Yelm High School. Frank, with his wife Jeane, moved to Yelm, living a block from the school. They would live and work in Yelm for the next 15 years. Once in Yelm he completed course work for the new administrative credential that was increasingly expected of principals. Six decades after she accompanied her husband to Yelm, Jeane Bower recalled with pride that Frank had been the first principal at Yelm with that type of certification. 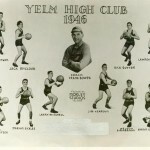 Frank Bower arrived in Yelm in 1938 and two years later took charge of the high school as principal. During that decade and a half at Yelm he seemed to do it all. 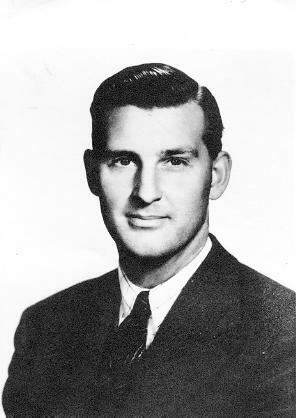 Bower taught the physics and chemistry curriculum. He was the math department for a number of years. In a pinch, he taught P.E. and even ran a photography class in 1950. 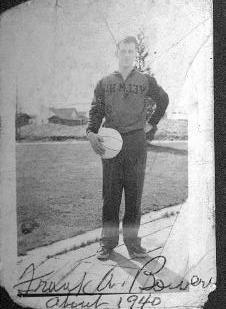 In addition to these responsibilities Bower coached basketball, baseball, and football at one time or another. Naturally, he was the head of the Lettermen’s Club, but found time to be senior class advisor on occasion. These, however were only his contracted roles. According to his son he also mowed the lawn of the football and baseball fields. On game days you might have found him lining the football field. Edgar Prescott remembered pouring concrete for a school sidewalk with Bower. When custodial help was busy, Bower put his carpentry skills to work. A small picture of Frank Bower in the 1945 annual, captured the era. There amidst the photos of student shenanigans was one of Frank Bower. He stood on the school grounds, leaning on a shovel. The 1945 high school was a much smaller world than the one that is exists at the time of this writing in 2005. For instance, the freshman class in 2004-05 numbered a little over 400. Sixty years earlier, according to the 1945 annual, the freshman class numbered 40 students. When the staff stood on the steps on the recently built brick high school, they numbered eight. 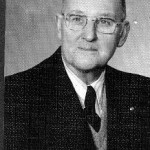 This included Frank Bower, principal and teacher. O.L. Montgomery was the superintendent and he joined the teachers for the photo. It was small fraternity of educators on the prairie at that time. Teachers lived where they worked. The road to Olympia wasn’t even paved yet. Besides, the school district required teachers to live in the district. They became a tight knit group. Not only did they work together, but socialized outside of the classroom. Jeane Bower, Frank’s wife, recalled that the Faculty Wives Club she belonged to often discussed books at one of their get-togethers. 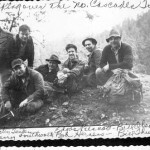 Bower even organized a staff camping trip to the Cascade Mountains. 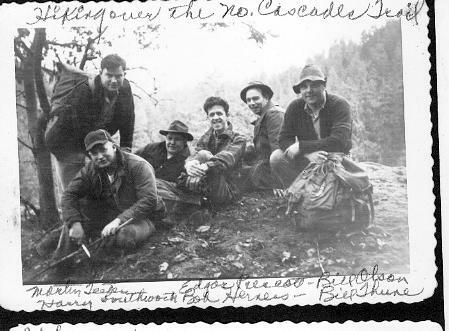 In one memorable photo from the trip are Yelm educators, Edgar Prescott, Harry Southworth, Bill Thun, Bob Herness, and Bill Olson posing before the camera of Frank Bower. Following basketball games, staff members and spouses would head over to the Bower place a couple of blocks from school. There they might talk about the game or a humorous incident at school. For four years news of the war must have flowed from person to person between sips of Jeane’s hot cocoa. It is not surprising that Bower participated in Yelm’s community affairs. He was a member of the Lions and could be found participating in their good natured fun. The latter being a bit different image than his students might have had of him. Introduction: Edgar Prescott was a social studies teacher in Yelm who worked with Frank Bower when the latter was principal of the high school. In his unpublished memoir Prescott described first meeting Frank Bower. The schools, Yelm High School and Yelm Grade School, sat side by side—We found them across the railroad track and a piece up the street to our left. They were more modern looking than we were used to, spread out along the ground instead of being piled up, one bunch of classrooms on top of another. In fact the high school looked new. Actually, we found later, it had been in use only a year. The old frame high school, the one it replaced, had burned to the ground a couple of summers before. Both buildings were surrounded by lawns and bordered by trees and a low hedge. I hunted up Frank Bower, the high school principal. There weren’t a lot of days left until school would start. Frank was a big fellow for that time, about six feet two—Anymore it seems that half the kids in high school are six feet two, even the girls—and he weighed close to two hundred pounds, all of it brawn, but he had a gentle voice and eyes that I described to Alice as being understanding. They were the kind of eyes you wouldn’t be bashful looking into if you were hurting or needing help or advice; but it sure wouldn’t be easy to look into them if you were figuring on telling a lie. Frank was about my age, maybe even a year or two younger, but already he’d been principal at Yelm, going onto ten years. Standing beside him, talking to him, I got the sudden feeling—Maybe I should call it a premonition—that I had got into the right school system, that with Frank running it, everything was going to go smooth as silk. But things were different back then. There was a war going on. There were only six teachers and a couple of hundred kids to teach. All of us had a lot of classes, and if any of us needed help or inspiration or an example, we had Frank Bower to look to. It was Frank who got me started off right in that general science class. He taught me how to set up those experiments, and how to prepare slides for the microscope. He lent me his rock collection and his biological displays. Frank was not only the principal—He had no secretary—he was also coach, football, basketball and baseball, and he taught all the math classes, and the Science classes—chemistry and physics—with the exception of the general science class I was teaching. And that wasn’t all! I was never more surprised in my life than on that Saturday morning when he rousted me out of bed and asked if I would like to help get the field ready for next Friday’s game . Good Lord! I thought. Saturday too! But I went. I wasn’t the only one either. Bill Thun was there—He was principal of the grade school—and Clancy Jean, the ag man. We picked the rocks off the field—It produced a new crop every season, Frank said—and we lined it with lime. Then we put up forms for a set of steps and a sidewalk leading from the gymnasium to the field. The next Saturday we mixed cement, in a box, with shovels, and filled the forms. Working Saturdays got to be a regular thing. Before basketball season started we painted the inside of the gym as well as doing a lot of other little jobs that needed doing. There wasn’t any fooling around like you might think, working without remuneration the way we were. Frank kept us at it. He had everybody’s job laid out and everything ready to go; and he did a lion’s share of the work himself. Following the 1953 school year, Frank Bower left Yelm for a job as a principal in the North Thurston district. 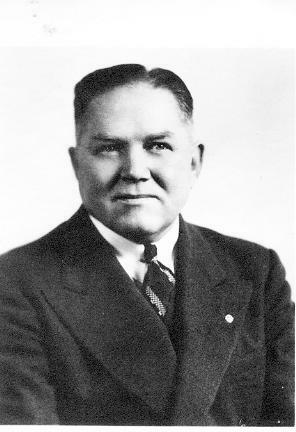 When North Thurston High School opened, Bower became its first principal. He remained there for the remainder of his career. The teaching world that Frank Bower retired from in 1973 seemed far removed from the one he entered during the depression. Students were less deferential. Teachers were organizing in unions. A Supreme Court case had held that student political speech was protected. Demands of curricula “relevance” were made by teachers and students, even parents. School papers were becoming more daring. Student dress codes were replaced with less restrictive regulations. 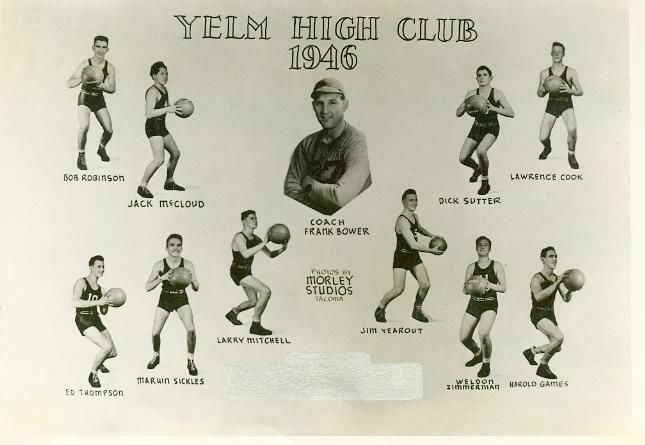 Yet, Principal Bower steadfastly believed “No problem of any size could not be solved if we were all willing to help the other guy.” In the 1940 Yelm Annual Principal Bower stood next to the school’s only African-American student, Alberta Arnold. The caption beneath the photo read, “Optimism.” Frank Bower would not have disagreed. Introduction: Frank Bower was principal of North Thurston High School when he retired in 1973. 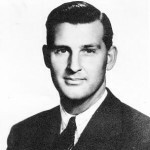 Bower was interviewed by a reporter from the school newspaper, The Rampage, during those last weeks of a long career. The following article resulted from that interview. Frank Bower, North Thurston’s principal since it opened 17 years ago, is retiring at the end of this school year. 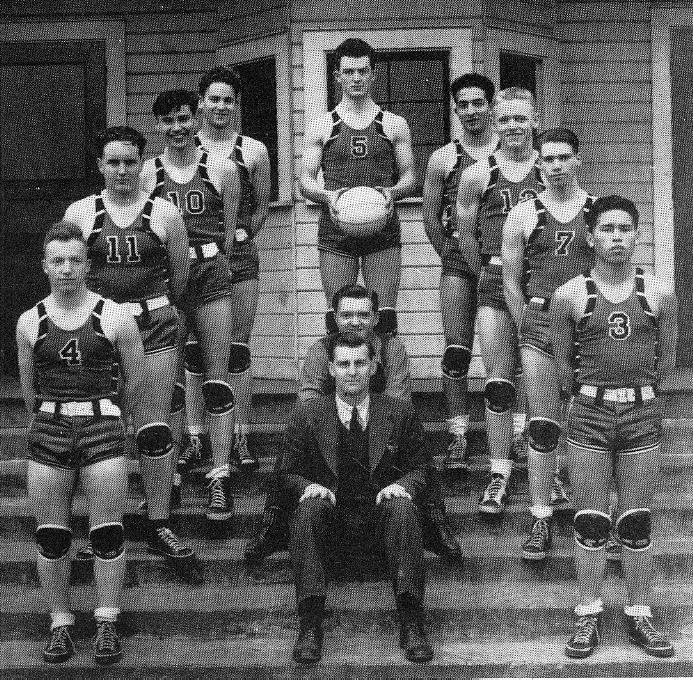 Mr. Bower attended the University of Puget Sound and then taught in Rainier for two years. Following that he was at Yelm for 16 ears, the last four as principal. He then moved to the North Thurston district and serve as principal at South Bay for one year while North Thurston was being built. Mr. Bower has lived in and around this area all his life. He was here even before 4th Ave. was paved, when trolley cars were used for transportation and before there were any roads or logging done on Capital Peak. He has witnessed changes other than those in the environment though. One of those changes is in the role the principal has been expected to fulfill. Mr. Bower feels the principal has become a middle man. He is tied to his desk by an ever increasing amount of paper-work. He has little time to communicate with teachers and even less to spend with students. Students also have changed dramatically. They tend to go to more extremes now. Mr. Bower recognizes the two main groups as those who are dedicated and function at their own spend with little direction and those who don’t know why they are here or what they should be doing. There is also less acceptance of authority by students. Mr. Bower would like to see the students a little more willing to accept as well as challenge authority. He feels this is mandatory in a situation where the school is over populated. Too many people too close together create a lot of friction, especially when they all have conflicting demands. Mr. Bower believes that North Thurston has a comprehensive program, but that students do not come prepared to take advantage of the knowledge that can be gained. They won’t put forth the concentrated effort required to learn. Over the years, Mr. Bower has observed the student government becoming more unsuccessful and feels the reason behind this is that students are just turning themselves off to it. He agrees that change is needed, but that limits must be set. Mr. Bower thinks that the practice gained though dealing with other people and working in committees is an invaluable experience. Although few students are aware of it, Mr. Bower was the one who suggested we have Mini Courses. He would like to see them continued and possibly expanded to twice a year. Editor’s Note: All pictures provided by the Bower family.